You spend approximately 1/3 of your life sleeping, so you might as well make the most of it, right? Great sleep leads to increased energy, boosts your immune system, and makes you feel better. The majority of your body’s healing and repairing happens while you sleep. So here are 10 Sleeping Strategies to allow you to sleep like a log and get the most out of your sleep. 2) Focus On Quality, Not Quantity! – The most healing and repair happens during REM sleep (deep sleep). 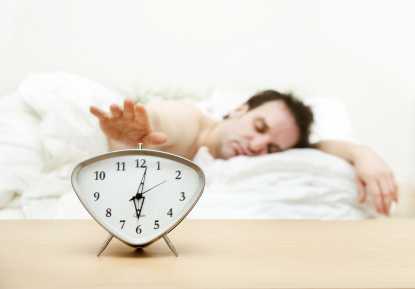 Research shows that the highest quality REM sleep is attained between 10 PM – 1 AM. 3) Avoid Sleeping Pills, Coffee, Sugar! – All 3 have an effect on your dream patterns and affects your rhythm and REM sleep. They also affect your nervous system. 4) Avoid TV Before Bed – Action packed movies stimulate your brain which make it more difficult to relax into a good state to get quality sleep. 5) Limit “Inner Chatter” – Morning prayer and meditation time has been shown to reduce inner chatter later in the day. If you have a hundred things going through your head, get out of bed and write them down. Putting it on paper will allow your brain to let it go. 7) Exercise In The Morning – Wake up, get your feet on the floor, and start moving. The harder you work throughout the day, the more your body will crave sleep. 8) Get To A Healthy Weight – Easier said than done, but it is true. Sleep apnea is much more common in people who are overweight. Do everything you can to shed those extra pounds in a healthy way. 9) Sleep With Good Posture – You want to be in the same good posture position when your sleeping as if you were standing up. Shoulders level, hips level, no head tilt. Get the right size and firmness of pillow to keep your head in the proper position. Try putting a pillow between your knees to take stress off the lower back and hips. 10) Get Adjusted – The upper cervical area is where your brainstem is. This is “Houston Control” and the healing center for your entire body. The brainstem controls the release of chemicals that control sleep such as serotonin and epinephrine. So there you have it! Sleep tight….and don’t let the bed bugs bite! P.S. Have a reason to get up in the morning. Find your purpose and mission in your life to get up and serve! P.P.S . A big thank you to Dr. Jennifer Cretsinger for helping me out with these sleeping tips!